From the Alerts list, select Prometheus to enable external alerts. Selecting Prometheus adds an Alerts tab to the lower pane to configure the Prometheus service. Alerts are disabled by default. From the Metrics list, select Hawkular or Prometheus to collect capacity and utilization data, or leave as Disabled. Selecting Prometheus or Hawkular adds a Metrics tab to the lower pane for further configuration. Metrics are disabled by default. You can obtain your OpenShift Container Platform provider’s CA certificate for all endpoints (default, metrics, alerts) from /etc/origin/master/ca.crt. Paste the output (a block of text starting with -----BEGIN CERTIFICATE-----) into the Trusted CA Certificates field. Enter the Hostname (or IPv4 or IPv6 address) of the provider. Enter a token for your provider in the Token box. To obtain a token for your provider, run the oc get secret command on your provider; see Obtaining an OpenShift Container Platform Management Token. In OpenShift, the default deployment of the router generates certificates during installation, which can be used with the SSL trusting custom CA option. Connecting a Hawkular endpoint with this option requires the CA certificate that the cluster uses for service certificates, which is stored in /etc/origin/master/service-signer.crt on the first master in a cluster. Enter the Hostname (or IPv4 or IPv6 address) of the provider, or use the Detect button to find the hostname. Click Validate to confirm that Red Hat CloudForms can connect to the metrics endpoint. Enter the Hostname (or IPv4 or IPv6 address) or alert Route. Enter the API Port if your Prometheus provider uses a non-standard port for access. The default port is 443. Click Validate to confirm that CloudForms can connect to the alerts service. Click the Advanced tab to add image inspector settings for scanning container images on your provider using OpenSCAP. These settings control downloading the image inspector container image from the registry and obtaining the Common Vulnerabilities and Exposures (CVE) information (for effective scanning) via a proxy. CVE URL that CloudForms requires to be open for OpenSCAP scanning: https://www.redhat.com/security/data/metrics/ds/. This information is based on the source code of OpenSCAP. Enter the proxy information for the provider in either HTTP, HTTPS, or NO Proxy depending on your environment. Enter the Image-Inspector Repository information. For example, openshift3/image-inspector. Enter the Image-Inspector Registry information. For example, registry.access.redhat.com. Enter the Image-Inspector Tag value. A tag is a mark used to differentiate images in a repository, typically by the application version stored in the image. Enter https://www.redhat.com/security/data/metrics/ds/ in CVE location. You can also set global default image-inspector settings for all OpenShift providers in the advanced settings menu by editing the values under ems_kubernetes, instead of setting this for each provider. In CloudForms, you can pause and resume containers providers. This allows users to add a number of potentially resource-intensive providers, then pause and resume those that are not required at a given time. Additionally, when performing maintenance on a provider, you can pause the provider to prevent CloudForms from connecting to it, to avoid generating log errors or collecting partial data. While the provider is paused no data will be collected from it. This may cause gaps in inventory, metrics and events. Also, the provider itself is not turned off when paused, but only temporarily disables the link between CloudForms and the provider. Resuming the provider re-enables the link between CloudForms and the provider. Click the containers provider that you want to pause. Click (Configuration), and then (Pause this Containers Provider). Click the paused containers provider that you want to resume. Click (Configuration), and then (Resume this Containers Provider). Edit information about a provider such as the name, hostname, IP address or port, and credentials as required. If you have just upgraded your CloudForms environment from an older version, edit the provider to specify the authentication method the provider uses to connect to Red Hat CloudForms. Edit the Name if required. Enter the API Port if your provider uses a non-standard port for access. The default port is 443. Click Validate to confirm that Red Hat CloudForms can connect to the endpoint. Under Endpoints in the Alerts tab, configure the following for Prometheus alerting from the cluster. 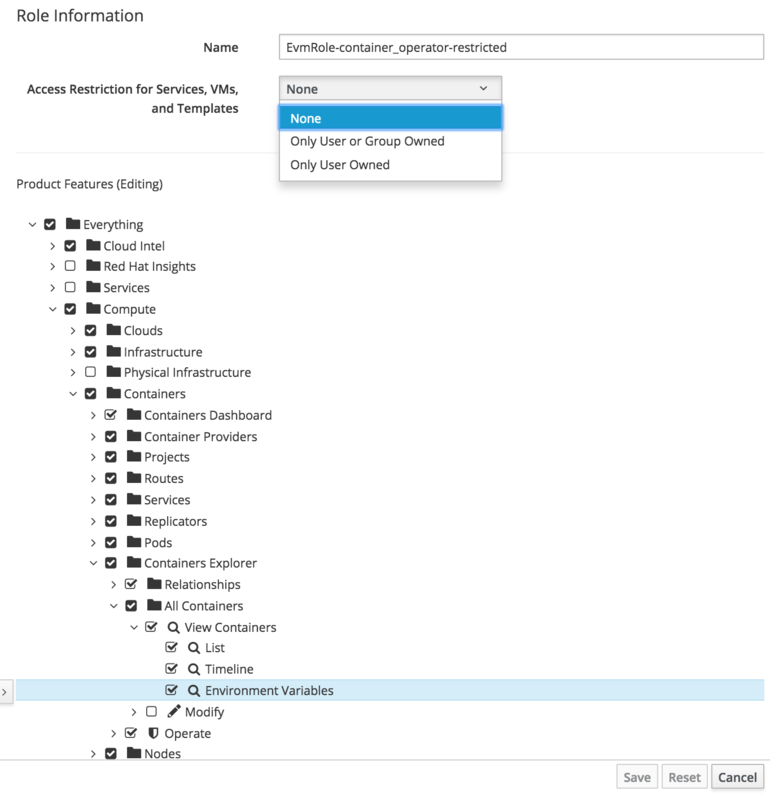 You can restrict users from viewing container provider environment variables by configuring user roles. This is useful as the environment variables panel can expose sensitive information, such as passwords, that you may not want certain users to view. The default user roles in CloudForms are read-only. To customize a role’s settings, create a new role or a copy of an existing role. You can view role information and the product features the role can access (marked by a checkmark) by clicking on any role in Access Control. Expand the categories under Product Features to see further detail. Click the Access Control accordion, then click Roles. Select a existing custom role from the Access Control Roles list, and click (Configuration), then (Edit the selected Role). Alternatively, to create a new custom role, select a role from the Access Control Roles list, and click (Configuration), then (Copy this Role to a new Role). Edit the name for the role if desired. For Access Restriction for Services, VMs, and Templates, select if you want to limit users with this role to only see resources owned by the user or their group, owned by the user, or all resources (None). Expand the Product Features (Editing) tree options to show Everything → Compute → Containers → Containers Explorer → All Containers → View Containers. Clear the Environment Variables checkbox to restrict the user role from viewing container environment variables. For more information about user roles, see Roles in General Configuration.